Tx Scrapper Mom: Happy Birthday Bugs Bunny! Yup! Today is Bugs Bunny's birthday! In his honor, today's challenge at Cooking with Cricut is to use a rabbit/bunny in your card, layout or project of choice. Working on this challenge kind of made me REALLY want a Warner Brothers cartridge. How fun would that be?! Anyways, being that I am Disney's biggest fan, I'm surprised it took me this long to use my Disney Classics cartridge (and I am yet to use Best of Pixar), but I just had to use Thumper's image! Your card is so cute!! Great job!! :) TFS! I love it I am a huge disney fan too I just cant get enough. Your Thumper is perfect! I love the colors and twine too. 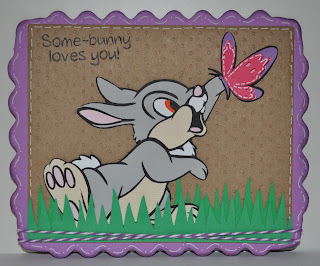 Love Thumper -- you did a great job piecing him, Roberta! Love this! This is darling!! I've heard some of the Disney cuts are have quite a few small pieces to work with---he turned out incredible!! !